What was the first vegetable you remember growing? As a child I can remember growing tomatoes and corn with my parents, as well as strawberries, raspberries, and even sprouts in a jar on the window sill. Country Boy has similar memories of growing vegetables with his family as a child as well. Growing our own vegetables began with just a few plants when we lived in Sydney, and since we moved back to the farm, growing our own vegetables has become a way of life for our family. 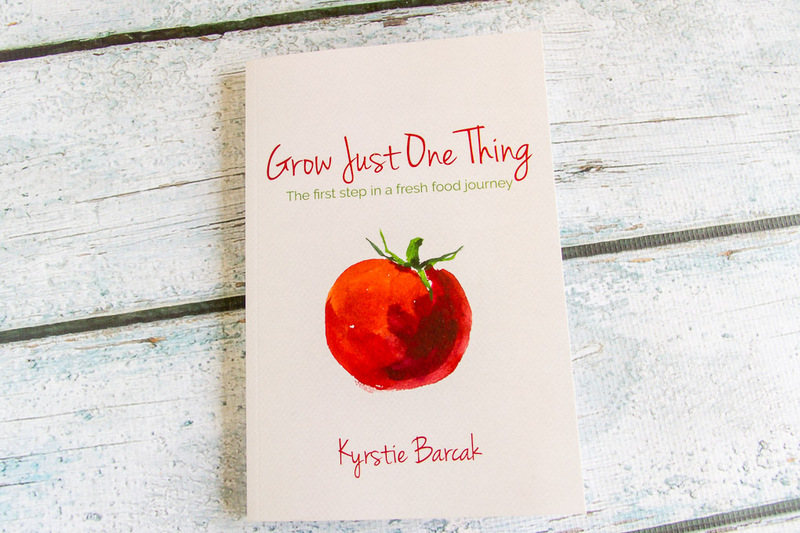 It’s this premise that my friend Kyrstie Barcak, from A Fresh Legacy has written about in her new book, Grow Just One Thing. Growing a few vegetables can be enjoyable and rewarding, and the start of a whole new lifestyle and approach to food. 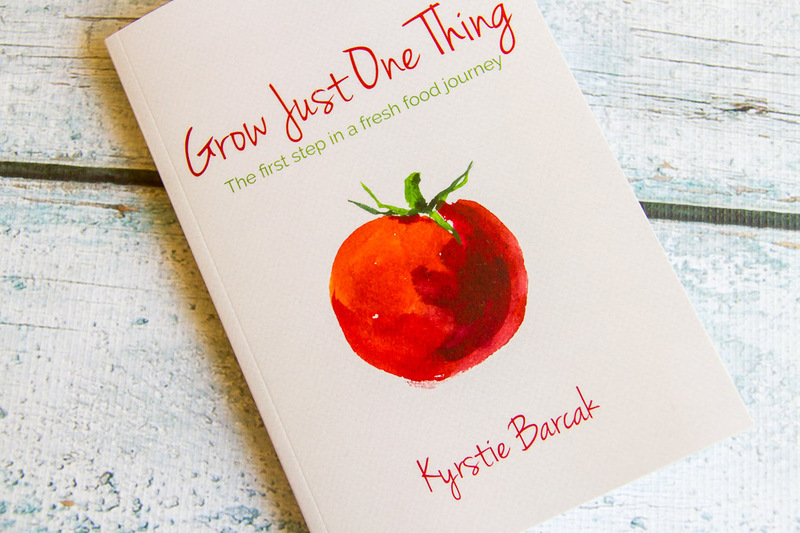 Often people want to grow more of their own food, but they get overwhelmed and don’t know where to start, Kyrstie starts right at the beginning; she goes through all the basics of why you should grow your own food, and how to get started by growing just one thing. She then takes you through how to plan what to grow, when to plant different vegetables, and how to look after them as they grow, as well as ways to involve the whole family in producing food. Through out the book she focuses on how small changes such as growing your own food can change your life for the better. Kyrstie also shows you how to cook with the foodyou harvest, as well as practical tips to enable you to make the most of what you have. From meal planning to simple, family friendly recipes, she covers everything a kitchen gardener could need to know to get the most out of their harvest. Kyrstie also looks at how growing food in the garden has changed the lives of other people as well. See that name there in the photo??!! Last year Kyrstie, asked me would I answer some questions about our garden and our life on the farm, and of course I said yes! Together with several other bloggers and gardeners, I have written about how we grow our food, and what effects this has had on all parts of our life. 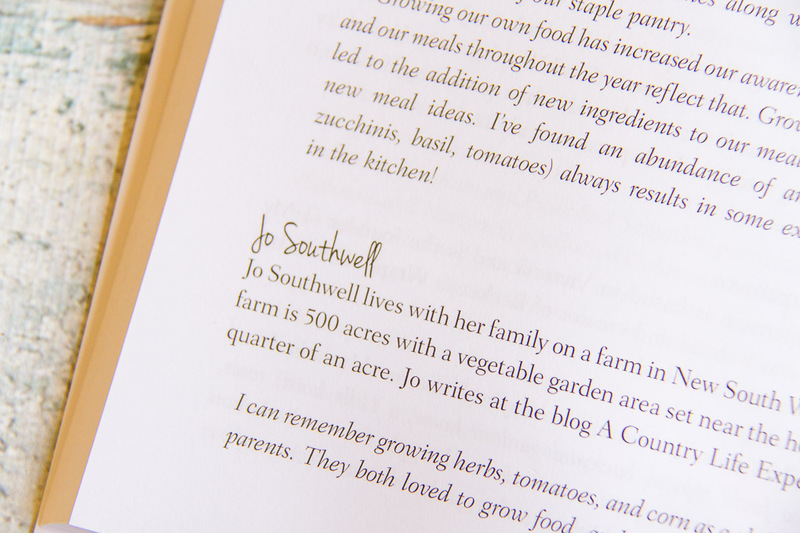 It was exciting to see my name in print, and I loved looking at how other people grow food, and how it has changed their lives. While this book is aimed at people who want to get into gardening, there is plenty in here for the more experienced gardener as well. You can get your copy of Grow Just One Thing here. Kyrstie is launching her book at the Melbourne International Flower and Garden Show this week, so you could also head along to the show and grab a copy there (be sure to say hi for me!). Kyrstie has also given me two copies of her book to give away. They come with a packet of organic seeds to start you on your fresh food journey (unless you live in WA or Tasmania – quarantine laws mean I can’t post you the seeds – but I will still send the book!) To win, tell me what was the first food you ever grew, or what food do you wish you could grow? I will choose two winners on Saturday March 26, 2016 and contact them for postage details. *Please note that while I received a free copy of the book as a contributor and reviewer, I am not being paid for this review and the opinions expressed are mine. This competition has now closed – congratulations to Candice B and Laura Murphy. What was the first food you ever grew? What foods do you wish you could grow? I remember my nannas garden, mostly playing with my cousin making concoctions. The first veg i have grown has been as an adult. I have grown pumpkin, cucumber, cauliflower and cabbage. I have lost my mojo and would like to grow more of our food for family. The first thing I ever grew were chillies. They were only ornamental but I wanted something different and colourful for my little apartment. I would never have thought of eating them then haha. I was in my early twenties and still pretty tame with my food. Now my tastebuds have changed I grow birdseye and jalepenos and put them on everything, even on a little cheese and biscuit with some thinly sliced jalepeno. Just gorgeous. The first things I grew were tomatoes and strawberries as a kid … Coincidentally I’m now allergic to both those things!! I had a typo – my surname starts with an S, not a D… Whoops! Herbs! That’s all I can seem to grow really. Memories as a child at my grandparents house picking her mint, parsley and Rosemary. I clearly remember those beautiful smells of fresh herbs. Now I have my own children we too grow those same lovely herbs and I am at master at growing them. We have now even attempted growing pumpkins and what a success it has been. My son declaring he is now a pumpkin farmer! Lol. I would love to continue to learn how to grow different vegetables that I have failed at in the past. Being self sufficient would be amazing. I remember mum and dad growing peas vividly, mainly because I remember being 4 and helping mum pick peas for tea. Having said that not many made it to the table because I would eat them rather than put them in the basket. So mum decided to section off part of her garden so that way I could grow and eat my own peas. Unfortunately due to currently renting and recently having moved house I would love to start growing the herbs we use a lot of and once the warmer weather comes back around growing our salads. Hopefully we can start growing what we need in pots over the cold winter we have. I have vivid memories as a child of my grandparents and my own parents knee deep in dirt, sheep poo and pulling out weeds in their respective gardens. Me on the other hand, have been dealt a genetic miss-match and have black thumbs. I have attempted a few times to grow veggies and herbs in the garden but everything has died!! So I have taken the advice of growing just one thing…and focusing on keeping my new hardy hibiscius and frangipani trees alive for a few weeks. Even if I don’t win, I think I will buy this book, I need all the help I can get! I remember growing tomatoes as a young child and silverbeet. I tell my kids now that if you learn to grow your own vegetables and fruits you will always have food. I wish I could grow a good potato crop. Maybe this year! The one thing I wish I could grow successfully is cucumber. In 7 years of growing my own vegetables I have only ever had 2 off a vine, and that wasn’t until last year and very late in the season. I did see this book circulating on the airwaves and it certainly has grabbed my attention! Well done on your part in the book. I am wanting to master growing strawberries. It seems everyone else can grow them except for me and I have no idea why I never seem to be able to get a good crop without puny little red fruit. Perhaps this book will unveil the answer. This is something I have always wanted to do, grow more of our own food. I always believed that I had black thumbs because I killed every house plant I have ever owned. This year to get the kids outside more I planted strawberries, cherry tomatoes, cucumbers, pumpkin and some herbs… and they grew!!! We have been harvesting tomatoes and strawberries once a week and using the herbs alot. We only got 2 edible cucumbers and no pumpkins yet, but the kids and I are loving it. I think I definitely need to read this book as it is something I really want to do more of in the future. Cooking and eating something we have grown ourselves is so much nicer than something that has come from a supermarket. Pumpkins will be ready in a few weeks. Well done for getting started! I can’t remember the first food I grew – it was just something we always did growing up, in our little suburban vege patch… I hope that the same holds true for my kids, that they just grow food instinctively. But I love the idea of the “just one thing” and if I could only grow one thing it would be tomatoes. They are why I keep doing kitchen gardening every season – they are just so much better than anything you can buy, and I can’t go back to supermarket (or out of season) toms every again. If I could grow just one thing… Avocados! But that’ll never happen in our cold winter climate sadly. The first thing we grew was when Phoebe was three or four and we decided to grow pumpkins! We had so much fun! The vine took over the entire side of our house but you should have seen our bounty by the end. Hubby had a friend who laughed at us, so they made a bet, if we could grow a pumpkin he would buy it off as at three times what you would pay in the supermarket. Lets just say he had to dig deep when we had our first one, it was huge!! !